1.1 The Xiaomi Mi Max is the more aggressive version of any smartphone that Xiaomi makes. Will giving it the 2Gb option make it less aggressive? 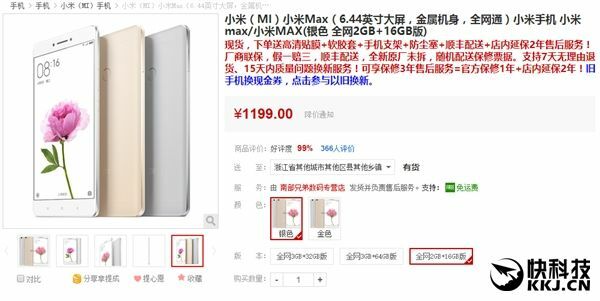 The Xiaomi Mi Max is the more aggressive version of any smartphone that Xiaomi makes. Will giving it the 2Gb option make it less aggressive? Xiaomi and its ever respectable lineup of value for money smartphone models keeps on ticking in to fill the gaps of the premium and the low end part of the market. Being the more aggressive competitor for this harsh market, how would their Mi Max phones priced for it to be attractive for consumers? The answer is a more lightweight Mi Max with 2Gb of RAM on TENAA. Price tag is $179 for a 16Gb model with 6.44-inch display and a Snapdragon 650 under the hood. The 3Gb configuration goes for around $230. But will the 2Gb version, perform less? Even of a super low price?